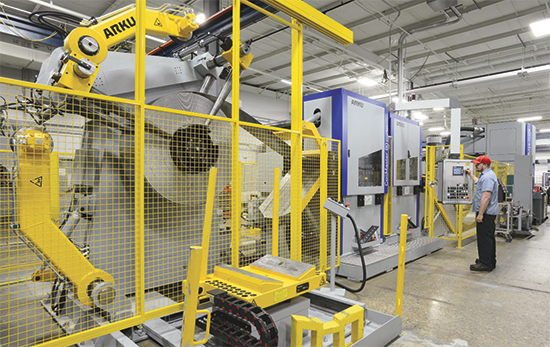 To optimize productivity from its newest fineblanking press, the Cincinnati, OH, metalforming facility of Feintool, a Swiss-based company, sought an ideal coil-handling solution designed to handle a wide range of material thicknesses. To avoid having to outfit its new press with two straighteners to accommodate such a wide range of material thicknesses, Feintool turned to Germany-based Arku Maschinenbau GmbH, also housing U.S. operations in Cincinnati, which supplied Feintool with its CoilMaster tandem leveler line. Material to 0.160 in. thick feeds through the smaller leveler; thicker material runs through the larger leveler. Reich also cites how easy it is to operate and maintain the leveler, thanks in part to the ability to open the units up widely for cleaning the rollers, and to rapidly thread material. “We’re changing coils in less than 5 min.,” says Reich. Reich credits this “seamless integration” with returning a five- to 15-percent increase in uptime.